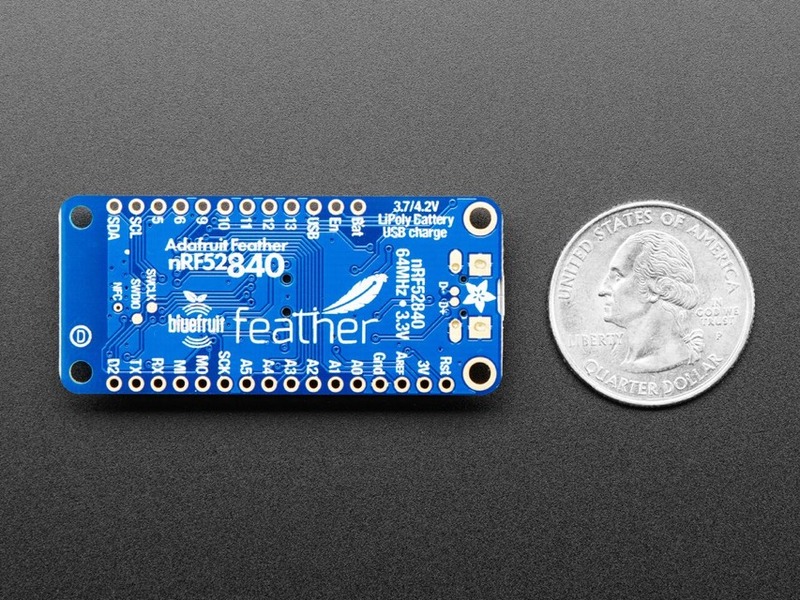 Adafruit Feather nRF52840 Express SIGN UP! @NordicTweets #nrf52840 @CircuitPython #circuitpython @arduino #arduino @adafruit « Adafruit Industries – Makers, hackers, artists, designers and engineers! Coming soon, SIGN UP NOW, these are going to go very fast. 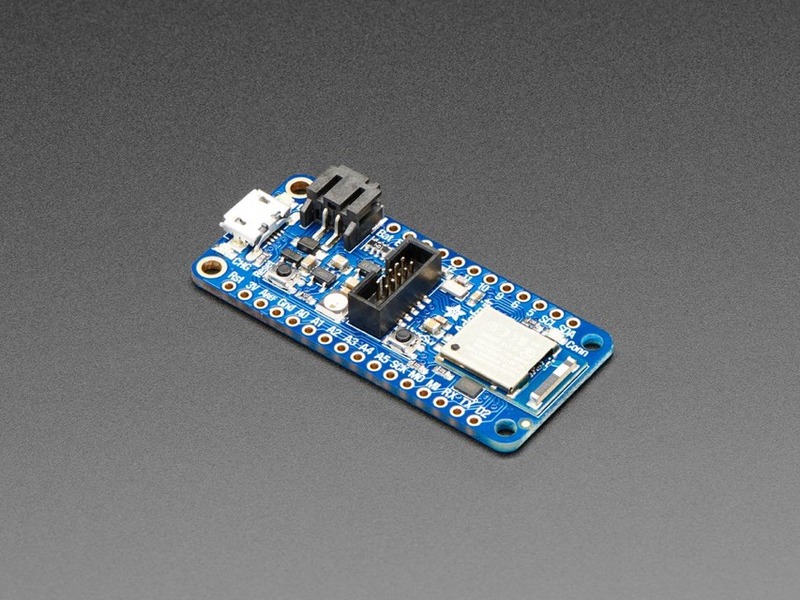 The Adafruit Feather nRF52840 Express is the new Feather family member with Bluetooth Low Energy and native USB support featuring the nRF52840! It’s our take on an ‘all-in-one’ Arduino-compatible + Bluetooth Low Energy with built in USB plus battery charging. With native USB it’s even ready to join the CircuitPython party. We have other boards in the Feather family, check’em out here. This chip has twice the flash, and four times the SRAM of it’s earlier sibling, the nRF52832 – 1 MB of FLASH and 256KB of SRAM. Compared to the nRF51, this board has 4-8 times more of everything. For this chip, we’ve added Arduino IDE support - you can program the nRF52840 chip directly to take full advantage of the Cortex-M4 processor, and then calling into the Nordic SoftDevice radio stack when you need to communicate over BLE. Since the underlying API and peripherals are the same for the ‘832 and ‘840, you can supercharge your older nRF52832 projects with the same exact code, with a single recompile! We’ve also chosen this chip for our first BLE-friendly CircuitPython board! CircuitPython works best with disk drive access, and this is the only BLE-plus-USB-native chip that has the memory to handle running a the little Python interpreter. The massive RAM and speedy Cortex M4F chip makes this a good match. Please note at this time we only have BLE stack support in Arduino. CircuitPython BLE stack support is still a work-in-progress! Some other upgrades we’ve tossed in are an extra ‘USER’ switch that could be used to trigger OTA updates (or whatever you choose), a NeoPixel LED for status updates, 2 MB of QSPI Flash for storing CircuitPython files, and a SWD connector. We have quite a few BTLE-capable Feathers (it’s a popular protocol!) so check out our BT Feather guide for some comparison information. We pre-programed the chip with our UF2 bootloader, which can use either commandline UART programming with nrfutil (we use this for Arduino) or drag-n-drop mass storage, for CircuitPython installation and also because mass-storage-drive bootloaders make updating firmware so easy. Want to program the chip directly? You can use our command line tools with your favorite editor and toolchain. If you want to use an SWD programmer/debugger (for even more advanced usage), we have a standard 2×5 0.05″ connector. Best of all, we’ve done all the heavy lifting of getting the low level BLE stack into shape so you can focus on your project from day one! The example code works great with our existing iOS and Android app. Bluetooth Low Energy is the hottest new low-power, 2.4GHz spectrum wireless protocol. In particular, it’s the only wireless protocol that you can use with iOS without needing special certification, and it’s supported by all modern smart phones. This makes it excellent for use in portable projects that will make use of an iOS or Android phone or tablet. It also is supported in Mac OS X and Windows 8+. To make it easy to use for portable projects, we added a connector for any of our 3.7V Lithium polymer batteries and built in battery charging. You don’t need a battery because it will run just fine straight from the micro USB connector. But, if you do have a battery, you can take it on the go, then plug in the USB to recharge. The Feather will automatically switch over to USB power when it’s available. We also tied the battery thru a divider to an analog pin, so you can measure and monitor the battery voltage to detect when you need a recharge. The Bluefruit LE module is an nRF52840 chipset from Nordic, which can be used as both a main microcontroller and a bluetooth low energy interface. For most people, they’ll be very happy to use the standard Nordic UART RX/TX connection profile – code is provided! In this profile, the Bluefruit acts as a data pipe, that can ‘transparently’ transmit back and forth from your iOS or Android device. You can use our iOS App or Android App, or write your own to communicate with the UART service. These are going to go quick, sign up now.